Dr. Jason Thompson became passionate about healthcare in High School after being treated for a football injury by a local Chiropractor. This sports injury had a quick recovery due to the right treatment, this was a pivotal moment for Dr. Thompson, he applies the important lessons learned from his injury into his practice. He earned a Bachelors Degree of Science in Human Biology and then went on to receive a Doctorate of Chiropractic Medicine Degree. 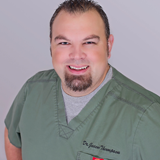 Dr. Thompson has been serving the Elgin area since 2010.